Q: Is there anything you wish you had the chance to do over? Trumane Bell: I thought I worked pretty hard at school. I thought I worked hard on the field. Sometimes I think, ‘What if I’d have worked just a little bit harder?’ Sometimes I’m just critical of myself, ‘Maybe I should have gotten in the weight room just a little bit more?’ But maybe that comes with age. I wouldn’t change anything about my experience. It was great to be able to play the teams we played and have the opportunity and show the world how we could play football. And the people I met in the classroom are lifelong friends, too. I wouldn’t trade it for anything. Q: Any good practice stories come to mind? TB: Oh, we used to goof around in practice. I can remember some times when it would be special teams period and we’d be doing onside kicks. The onside kick team would be out there, and I remember catching the ball and then running the option down the field, taking it all the way down the field. 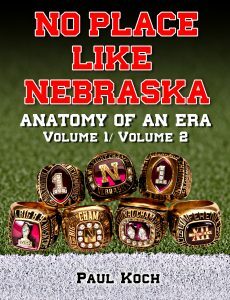 And it’s funny, because Tom Osborne never said anything about it, he just let us goof off about it. And I remember going, ‘Oh, that’s kind of strange.’ And we did it every week. I can remember us being out there dancing around and doing silly stuff on the practice field, guys doing the silliest things. Here we’re acting like goofballs out there, but the coaches never said anything. I guess they really wanted us to enjoy being out there, and I appreciated the fact they let us do the things they did. We knew when it was time to get serious even though we did have fun sometimes. Q: You didn’t have Charlie McBride barking down your neck? Q: Who would you go up against a lot in practice? TB: Well, when I was playing tight end going up against Trev Alberts and Jared Tomich (when he was a younger guy on scout team), Dwayne Harris and Donte Jones, Ernie Beler, Darren Williams, Troy Branch, Lorenzo Brinkley, Troy Dumas, you name it, all those guys. It’s funny, because I can remember going against Trev and I’d just moved to tight end from split end and was thinking it was going to be interesting, to say the least. I learned pretty quickly that you can’t be playing around with Trev Alberts in a one-on-one situation. Q: He’d make you look foolish? Q: Any memorable off-field occurrences? TB: There are so many of them, just a lot of things. Like I say, it was more of just being with the guys. We’d have an intramural basketball team, kicking it at home or the intramural league in basketball, just hanging out at a guy’s place having some barbeque and relaxing, just hanging out with the guys and getting to know each other. At times we’d go hang out at Amigos. I don’t know if that’s still around. TB: Yeah, but it was just hanging out with the guys. Q: Was there any one person behind the scenes who made a difference in the program, getting to the national championship game your senior year? TB: I definitely feel the whole strength and conditioning staff played a huge role in getting us guys to that national championship game. All the guys in the Academic Center, too, those people there who kept us in line as far as getting to class, making sure we made the grade and making sure we graduated. I don’t know if many people realized we had a ton of guys, my senior year, that had graduated, that were done. I had already graduated that summer before my senior season, so I was taking grad courses. But it was pretty nice, because you didn’t have that weight on your shoulders of trying to graduate. There were five of us: Troy Branch, Lance Gray, myself and couple more guys that had already graduated. And to me that was impressive, you don’t see that in a lot of programs where five or six guys had graduated. And then we had other guys who graduated that December. That pretty much shows you how the academic staff was pretty impressive, how they were really dedicated to helping us finish school early, pushing us with more than football. Because we didn’t go there just to play football, it was about school, too. And you’d work on those things and get it done, and I think that was very special. Q: Are you the oldest of all your siblings? Q: So you’re the first kid in your family to get your college degree, then? Q: So thinking back to the national championship game and the culmination of your career there, what do you think made Nebraska one of the two greatest teams that year? What made Nebraska stand out? TB: I think it was how hard we played. It showed on the field. 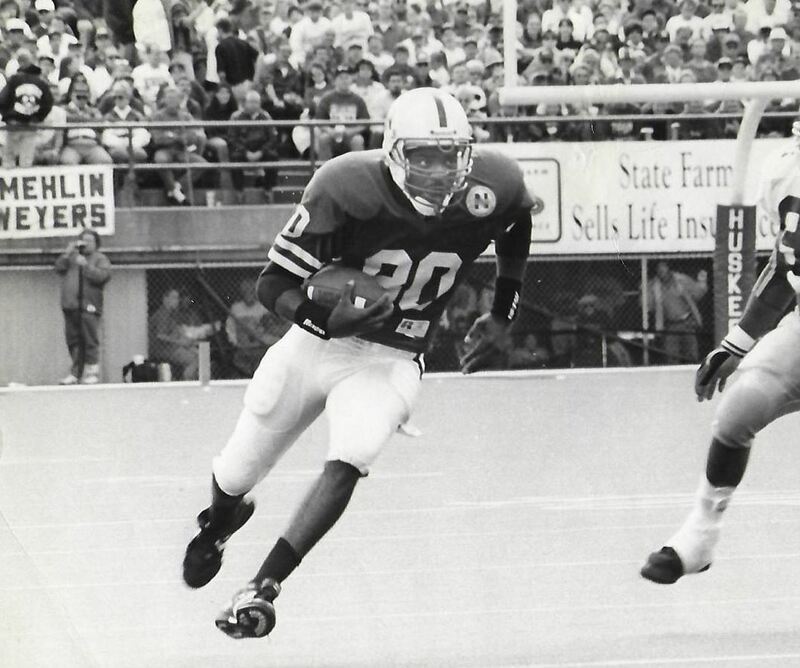 We went out there -and the year before we had lost a couple ballgames- but from the end of that bowl game in ’92 we had a goal, “We want to get our respect back.“ And seeing how hard the guys worked in spring practice and the weightroom, and then come in the summer and then fall camp, we made it a point that when guys played us they were going to feel it. They were going to walk out of that stadium and say that they were in a ballgame. I think we played like that every game. We had opportunities where we persevered. We kept plugging at it, we didn’t stop because we didn’t think we were ever going to lose. And you could see that character develop, the confidence each game, and the guys just kept playing harder and harder and harder. And guys were saying, “Hey, we can get this thing done.” And then we got to the national championship game and we said, “This is where we were meant to be in the first place,” we knew we were going to have our opportunity and we were going to lay it all on the line. I believe everybody laid their heart out on the line in this game, and even though we lost that ballgame I don’t think anybody on that field left the field with their head hanging low. Because, you know what, they gave their best effort. And a few calls definitely would have changed the ballgame, but we knew we were the best and people learned a new respect for Nebraska. The Florida States and Miamis of that time were all speed, and everybody said Nebraska has all these slow kids from Nebraska and they can’t play, that’s what they’d always say. That game we got Charlie Ward five times. That never happened all year, and we were just moving the ball up the field. And Florida State was worried about that. They were definitely worried, because the year before they were hanging out with us having a good time and, “Tomorrow we’re gonna beat you guys.” That year they didn’t come hang out with us because they knew they were going to be playing a real physical game, oh yeah. Q: So the baby gremlin was now a raging, full-grown monster of equal size? Q: So thinking back, what have you taken from all those experiences? What holds meaning for you today? TB: One thing: always work hard. What you put out is what people are going to take from you. What I mean by that is, by giving your all people can definitely see that. Another: live your life like a champion. If you live your life like a champion good things always will happen. And I also believe that if you’re keeping God first, great things will happen for you. A lot of people don’t realize, being coached by Coach Brown and Coach Osborne -very spiritual people and yet they didn’t force it on you- but you see those role models and how they lived their lives, how they were great men of character, it just kind of overflows to you. You don’t want to let them down, you want to live your life and get to where they are. I think just being around those great men kind of rubs off on you whether you wanted it to or not. Q: So when you do talk to co-workers or whomever, do you say, “I played for the University of Nebraska” or “I played at the University of Nebraska”? TB: I say that I went to the University of Nebraska and I played football. Q: A-ha. When you say that, what does that mean to you? TB: I would say it was the family atmosphere that set us apart. We were a big family. It’s still like that nowadays; I catch up with guys all the time who played ball with me or played a few years ahead of or after me, you catch up with them and it’s like you all played together because we’re one big family. And it’s great. 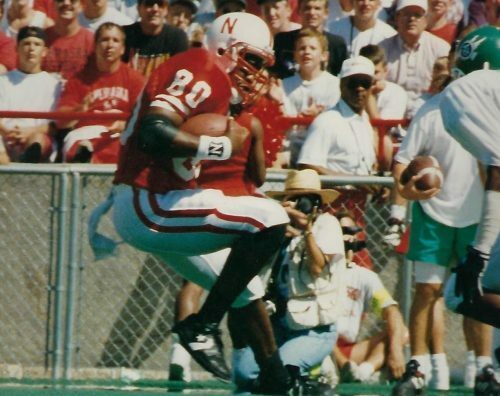 As a matter of fact, there are Huskers who played for the Chicago Bears: Zack Bowman, for example. And even though he played under different coaches with Callahan and all, he’s still a Husker. And even when Mike Brown was here, I didn’t know Mike very well because he played a few years after me, but me and Mike would just hang out. Mike had a great career with the Bears, but I always look for the Huskers. Always. I always look for those guys. Kareem Moss brought it up earlier, and Trumane’s mention of “wanting to get our respect back” after the ’92 bowl game says a lot about the mentality of the team as a prelude to the 60 & 3. One senses the early motivator for those teams was first and foremost to garner respect after successive year’s bowl losses, especially that previous year’s loss to the same Florida State squad. Only after earning a semblance of the nation’s respect in the course of that ’94 Orange Bowl loss were they able to go on to use revenge, the memory of that game’s bitter loss, to their future advantage. One hurdle crossed led invariably to the next. I know that Rob Zatechka denied it earlier, but too many others think that a momentous leap forward occurred in that game. R-E-S-P-E-C-T, Aretha Franklin used to belt out. Perhaps she should have recorded ‘R-E-V-E-N-G-E’ as a follow-up. Trumane also referred to the esprit de corps, the tenacity, the physicality-obsessed mindset that drove them to downright bludgeon their opponents as they weekly pressed forward to victory. It was the ‘Nebraska Way’: “We made it a point that when guys played us they were going to feel it. The great reward for this never-say-die-while-you-punch-‘em-in-the-eye attitude was a steely resolve and resiliency that made them near unstoppable, “..you could see that character develop, the confidence each game, and the guys just kept playing harder and harder and harder.” Respect to revenge to roughness and toughness. Where there’s thunder there’s lightning, and these guys brought the sound and the fury.